RDB ProNet suitable for all sizes of business from a one user start-up through to global enterprises with thousands of users. RDB Pronet Reviews Recently Reviewed! 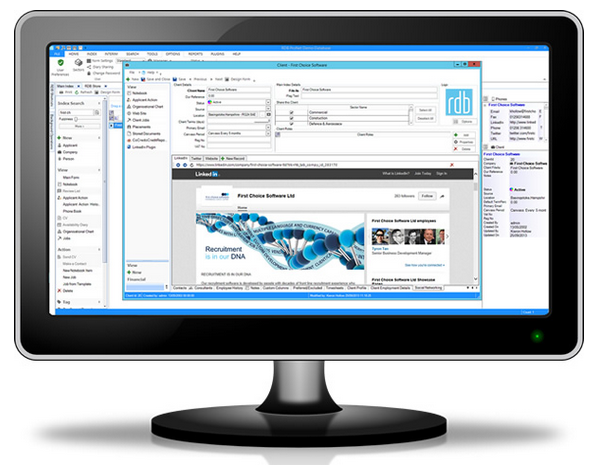 Pros: Our company have been using RDB for over 12 years and in my 10 years managing it we have seen a lot of changes! RDB is easy to use as a whole, you have the option to customise the look & feel as well as being able to hide fields that you do not use. The support team are quick to respond in most cases too. Cons: Lack of in-built reporting. We have tried their "Insight" solution which worked OK at the time but was clunky to configure and building a new dashboard would take days. We have since moved our reporting to Microsoft Power BI which is absolutely incredible. The fact that RDB is SQL-based means that we can report on any aspect of the database, the result is a set of custom dashboards that we use for high-level MI, revenue tracking, placement source tracking, calls and KPI reporting, etc. The fact that it's still a desktop application is a bit of a shame in this day & age with consultants having 30-40 windows open at times, no easy way to move to browser version without paying for expensive hosting solution & losing access to ALL custom analytics. We would also like a GUI utility to be able to import data from Excel into RDB. More and more support calls/requests are deemed to be "custom development" work at a very high cost. Overall: Very good overall, some of the expensive add-on products haven't been as useful as we originally hoped but the core RDB ProNet product works very well. We are hoping to move to the browser version in the next 1-2 years which will give the database a new lease of life whilst maintaining all of the records we have built up over 12 years. Fairly easy to use for basic tasks, but anything else will cost you! Comments: I've been using the system for 4-5 months and it is fairly simple to use, although if you are doing multiple tasks you end up with lots of seperate boxes open which can get confising. When you speak to support about something they will often refer you to their developers for 'additional work' that requires extra payment. This includes simple things you would expect from any CRM like being able to add a logo to invoices (why this needs bespoke coding I do not know as surely every client needs it!?) and importing data from excel into the system. If you want to use these, make sure you get EVERYTHING in writing that you want from the system before starting as you will pay handsomely for anything else. I'm not the only one to experience this. You are also not allowed to contact the support line unless you have been on their training course, which costs about £400 per person for the day so factor this cost in. Note: The remote desktop version is slow and it will not allow you to use Google Chrome (the worlds most popular browser) which hindered many apps I use to automate processes, slowing down my day. Go with the desktop version if you want to use Chrome. To summerise, would I recommend it?... Probably not to anyone starting out as your start up capital will take a big hit. We have been using RDB Pro Net for almost 10 years and we couldn't be happier. Comments: Prior to launching Purosearch we looked at a number of suppliers and we decided that to go with RDB Pro Net, because in our opinion the product looked the most impressive and the team at Firstchoice Software were the most attentive. The innovation and functionality of the product is superb, and combined with the reporting tools available I can't imagine another product coming anywhere near. Over the years Firstchoice Software have become our most important business partner and we are still delighted with the choice we made back in 2006! Comments: I have used RDB for 15 years now starting as a sole user working from home to now having 75 staff across offices from London to Birmingham. As my company has grown , so has theirs but the strength of the relationship at Board Level as well as at day to day support level has always remained the same. It is a great package, constantly evolving and one that i would highly recommend to others in the industry.